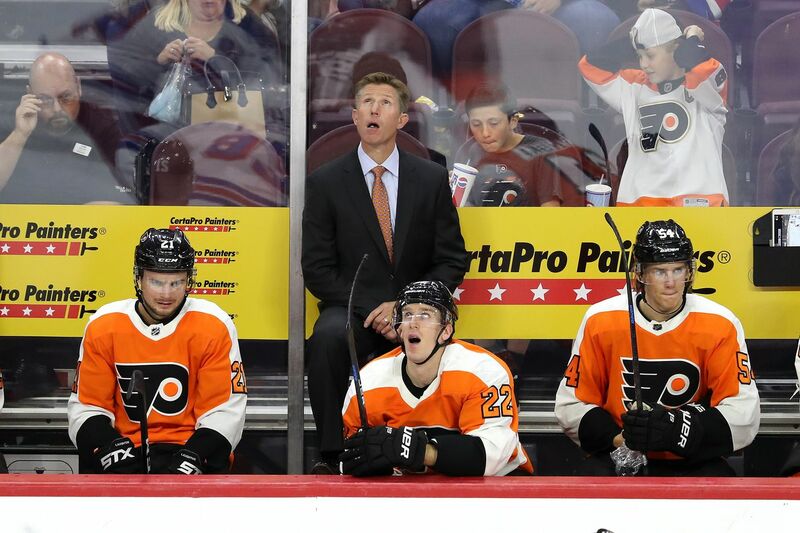 Coach Dave Hakstol and the Flyers are experiencing slow starts to games — again. Stop me if you've heard this before. The Flyers are near the bottom in the NHL in penalty killing. They have a problem with slow starts to games. They have to "just clean up a few things'' to improve their ability to win those games. On second thought, stop them. Someone. Stop them from living out the definition of insanity night after night, month after month, year after year, playing in the margins of mediocrity while claiming some sort of upward trek to the top. No one at this level in sports believes in moral victories. That's what they tell you, readily. But the up-and-down play of this team is often accompanied by talk that can easily be interpreted as that. When they went on a 10-game losing streak late last fall, there was talk about gaining points through overtime losses. Just last Saturday, after a 5-2 victory over the Devils, Hakstol lauded his team's defensive effort over the three previous games. Flyers opponents scored 12 goals in those three games. And yet you kind of know what he's talking about. There are long stretches in which they do play well – Hakstol counted about 15 "A'' chances Tuesday — and they have been spooked recently by bad breaks: Christian Folin falling down; Claude Giroux fanning on a shot from just inside the Avs blue line early in the third period, leading to Gabriel Landeskog's breakaway goal and a 3-0 Colorado lead. Giroux, Sean Couturier, Jake Voracek, Wayne Simmonds – the Flyers veterans are not the root of this team's problems. All are incredibly talented players who would fit into any established team. But fair or not, they have to be more than that with this team. They are the gold standard for the kids coming through, so when Voracek back-checks indifferently at a critical juncture or the captain makes a high-risk, low-reward play that leads to a juicy chance the other way, it's more than just a singular mistake. And it makes it hard for them to then dig into one of the kids for a similar gaffe. Claude Giroux skates with the puck against the Avalanche. After the Flyers were blasted out of their own building earlier this month, veteran goaltender Brian Elliott spoke of the need for "structure.'' Elliott might be struggling with the inconsistencies that come from age and beaten-up groin muscles, but he sees the game as a coach or GM does, or should. "What I mean by structure is everybody is working for each other, close support, when we have guys coming back hard, back-checking, it helps the D out, prevents them from getting really good opportunities. That's what I mean by structure: Basically not having guys, like, hang below and hoping for a breakaway pass or hoping things come back the other way. Yes, they are young. They are a transitioning team, especially at the back end, where games are won and lost. Their big free-agent acquisition, James van Riemsdyk, is on the shelf. Their goalie of the future, Carter Hart, is down on the farm, struggling with consistency there. And they have a talented core group that has won just one playoff series since ascending to the top of the team's food chain. What's wrong with the Flyers? Stop me if you've heard that one before, too. The most frightening answer might be nothing, really. They are, and have been for much of Hakstol's tenure, what their record says they are, as Bill Parcells so famously said. Adding in overtime losses, Hakstol's record after three-plus seasons is 126 wins and 129 losses — reflecting a team that is perennially neither good nor bad; a team with streaks, peaks, and valleys, playing on the fringes of the league's playoff picture, sometimes squeaking in, sometimes not. Yeah, I know. You've heard that before, too.